There’s a very popular community on Reddit famous for “Explaining it Like I’m 5.” Users present the community with complicated niche questions, related to everything from car maintenance to physics, in the hopes that they will receive a simple answer for a complete rookie. The answers that community puts out are charmingly helpful, and I would be lying if I said I didn’t turn here for help from time to time. Marketing Tech can seem like one of those complicated, niche fields. Probably because, to people just starting out in the space, it is. I’m sure all marketers remember the first time they encountered an automated tool and tried to get a sense for everything. “How does all this work?” you asked. “What do all these features do for me? And what’s a vendor?” If you’ve asked those questions recently, or if you consider yourself a newcomer in the realm of marketing automation, we’re here to break everything down so simply a five-year-old could keep up. Marketing automation is a really broad term that covers a lot of different software tools. The ways these tools work are going to vary as different manufacturers, which we refer to as vendors or providers, prioritize different functionalities with each their own levels of success. The one common thread among all the products in the market is that they all are offering a service that is ideally supposed to augment the capabilities of your marketing team. The tools, often called solutions, help your team in two main ways: saving time and operating in ways which humans cannot. You’re a marketer. Your job is to funnel leads (potential customers) into the sales department to turn them into paying customers. That’s your bread and butter; that’s what you live for. And to get to that point, you need to cross off a lot of housekeeping items that, let’s face it, aren’t the most fun things in the world to do. Collecting and processing data from previous efforts, maintaining and supporting lead relationships over time, writing up targeted emails, monitoring social media, and segmenting your leads; these are things that you have to do, but nobody relishes them. They are also all mainstays of marketing automation tools. All of the humdrum tasks listed above are, with the help of a solution, done with minimal human input and, as a result, become less time and energy intensive. And it doesn’t take an expert to know that a marketing team with more time and energy are going to be able to do more quality work and do it faster. Marketing technology also helps marketers do things they just wouldn’t have been able to do otherwise. Scale and Speed are the main things to keep in mind here. Marketing tools, especially those powered by artificial intelligence, can do more and do it all faster. In the time it would take a top-shelf marketing professional to send out 100 emails as part of a campaign, a good automated solution could send the emails, analyze lead behaviors and click-throughs, and start to report back what parts of the email were most effective with what types of leads. As previously mentioned, with so many vendors out there, there are plenty of options for variety in software. Different providers cater to different kinds of clients at all levels of business: small, medium, and large. Further differences in vendors go a little above the bare-basics level we’re staying on for this article, but we’ve covered plenty of in-depth vendor news and comparisons in the past. For the more curious novices looking to dive right into vendor comparisons, there’s the useful G2 Vendor Chart and the TrustRadius Vendor Map. 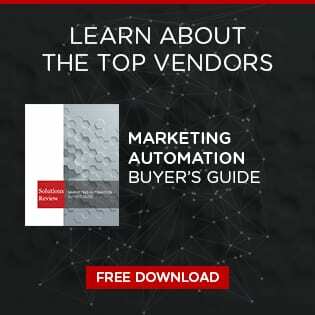 And for the truly we have a free buyer’s guide available with easy-to-read and comprehensive breakdowns of 28 of the top vendors in the marketplace right now. That was the high-level overview of what marketing automation is. Of course there’s a sea of additional information out there. MarTech is a rapidly moving and exciting field and there’s always something new to learn, even for the seasoned vets out there. Feel free to explore the rest of this site to use as an education resource and below are some selections that newcomers to the marketing automation world may find particularly useful. How to Know Which Solution is Right for You?